Found 3 file extension associations related to XenoDream and 1 file format developed specifically for use with XenoDream. Developer / company: XenoDream Software, LLC. 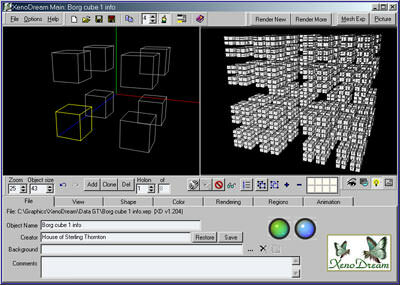 XenoDream is a 3-D graphics program that could be described as an artist's workshop, adventure playground, tool or toy. It is a flexible environment incorporating 3-D object creation, 3-D lighting and filters, 2-D layering and various other operations. XenoDream's object modeling is unique and very powerful, combining smooth shapes and 3-D IFS fractal methods. This allows it to cover vast possibilities, from constructing the simplest objects to exploring wild shapescapes. There are no formulas or programming to learn; it is entirely interactive. If you need more information please contact the developers of XenoDream (XenoDream Software, LLC. ), or check out their product website.